How's 2018 treating you so far? Are you still riding your first-of-the-year motivation? Or has the glimmer of the new year started to fade? We know how challenging it is to stay committed to your goals, resolutions and intentions so we're offering a little help this month. Starting Saturday, February 10th through Wednesday, February 14th at midnight, join us for our LOVE YOUR YOGA MID-WINTER FLASH SALE. During this time, you can pick up FIVE CLASSES FOR $55 or 10 CLASSES FOR $99 - this deal will get you get back on your mat, if it's been awhile, and will help you get through those mid-winter winter blues! Yoga classes make excellent Valentine's Day gifts! Nothing says 'I LOVE YOU" like a gift that helps your loved ones feel better AND live better. Ask your instructor for a gift certificate after class. Pair a gift card with a block and a strap for your beloved yogi - All retail will be 20% Off (excluding Young Living Essential Oils) through February 14. Many apologies to all who were planning to attend Rest, Breathe & Unwind this evening. Due to unforeseen circumstances, we must cancel class for this evening. If you were pre-registered for class, you have received our cancelation email and will not be charged for class. We sincerely apologize for the inconvenience. Class will run as normal next week, Sunday 2/11. Namaste inside and be warm, friends. Please join us this Saturday, November 25th for Small Business Saturday! #ShopSmall and support your neighborhood businesses this holiday season. The Studio Yoga will open our doors for the whole weekend - Friday Nov 25 - Sunday Nov 26 - from Noon-5pm. 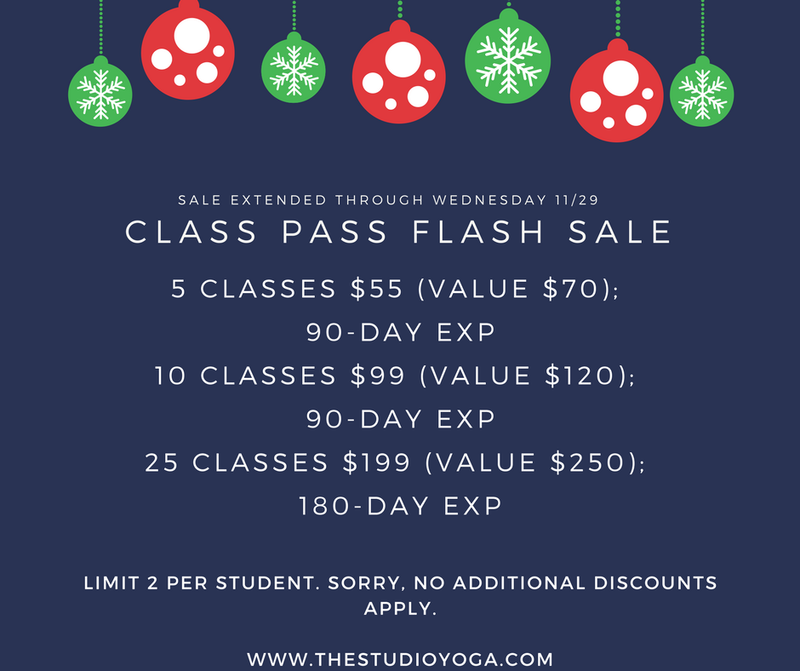 Keep that yogi-glow through the holiday season and ride that joy right into the New Year with our Holiday Flash Sale - discounted pricing on our 5, 10 and 25 class passes. Want to share your love of yoga? We are running a great deal on Gift Certificates - give a gift, get a gift. Need props to support your home practice? We'll be carrying a few essentials at The Studio Yoga - blocks, straps, bolsters and eye pillows make it easy to get your practice in at home when you can't make it to The Studio. Don't delay! Our Flash Sale will run from Black Friday, November 24 through Cyber Monday, November 27 at midnight. Sparkle in your body, mind and soul. A DEEP BOW OF GRATITUDE TO OUR YOGA COMMUNITY - YOU MAKE EVERY DAY A DAY OF THANKS GIVING! For those of you who will be celebrating your day of thanks locally, we are running our regular class schedule every day this week EXCEPT for Thursday, Thanksgiving Day. We will be hosting our 2nd Annual All-Levels Donation Yoga Class - Please join Katie Dunlap for this special 8am class. It's a wonderful way to get a little mindfulness and movement in before your Thanksgiving day events begin. ALL proceeds from the class will go to Feeding America of West Michigan. Join us for for our special #ShopSmall holiday shopping hours this weekend! 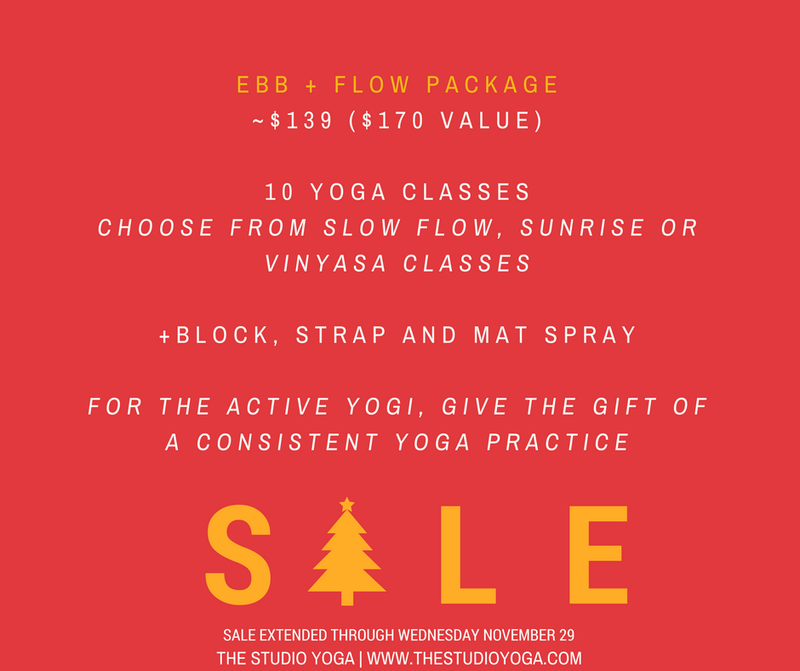 The Studio Yoga will be open Noon-5pm on BOTH Friday and Saturday for #SmallBizSat with special pricing on class packages, gift certificates and yoga gear for the yogi in your life. Stop in to see what special product items we're carrying this holiday season - warm up with cuppa tea and a treat. Saturday evening, Jennephyr is offering a Special Candlelight Renew + Restore yoga practice. This nourishing 2-hour restorative yoga practice will prepare you for experiencing deep joy this holiday season. Class is 5:30p-7:30p on Saturday, November 25th. MAY YOU AND YOUR FAMILY BE WELL THIS THANKSGIVING!